Is Counseling the Solution for Depression? Everyone feels sad or gets “the blues” on occasion, but those feelings typically subside after a short period of time. Depression is defined as a serious mental illness that is characterized by the persistent and overwhelming feelings of sadness, hopelessness and apathy. There are many forms of depression that can develop because of specific circumstances and affect people differently, such as psychotic depression, postpartum depression, and bipolar disorder. Severe depression can interfere with the ability to eat, sleep and enjoy life. This article discusses the various solutions for depression, as well as common causes and symptoms. Before getting into the solutions for depression, it is important to understand what causes depression and how to recognize the symptoms. Depression is a mental illness that develops over time, and can be triggered by a number of factors, including biological, environmental, family history, and emotional trauma. Some people are at higher risk of developing depression than others, depending on genetics and lifestyle. Depression is twice as common in women as it is in men. Researchers believe this is linked to hormone fluctuations women experience after puberty, specifically during menstruation, pregnancy, and menopause. Estrogen significantly affects the brain's regulation of moods and emotions. Older women going through the menopause transition are at higher risk of developing depression because their estrogen levels are considerably lowered during menopause. Depression symptoms can be divided into physical and emotional. Physical symptoms of depression can include fatigue, insomnia, changes in appetite and weight, body aches, cramps, and headaches. Emotional symptoms are suicidal thoughts, irritability, apathy, and feelings of helplessness, guilt, and worry. If you think you are suffering from depression, it is crucial to seek professional help immediately. Symptoms typically worsen the longer you wait to get treated, so make an appointment to talk to a doctor. 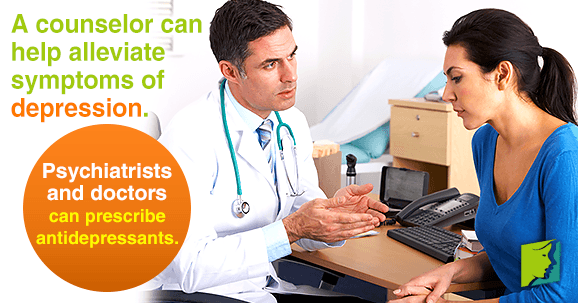 After making a diagnosis, the doctor may refer you to a counselor. Talking with a professional counselor can help alleviate symptoms of depression. In severe cases, psychiatrists and doctors can also prescribe antidepressants, which have been known to help keep depression symptoms at bay. Staying active and exercising regularly releases mood-regulating neurotransmitters, like serotonin and endorphins, in the brain. Exercising also has other health benefits, such as improving mood, deepening sleep, increasing energy, and reducing stress. Having a solid support system is also instrumental in helping with depression. Surrounding yourself with loved ones and talking to them regularly so they can understand what you are experiencing, can help lessen depression. Depression is a serious mental illness that should be treated as such. Unlike sad moods, depression is a constant psychological state that can interfere with daily life. Symptoms of depression can include anything from fatigue and insomnia to suicidal thoughts and helplessness. It is crucial to get treated as soon as possible if you think you are suffering from depression. Counseling, antidepressants, and staying active are all helpful ways to treat depression.